This is the second article in a series of posts exploring the life of Great War veteran, Arthur Roy Baxter. Click here for part I. Sanctuary Wood in 1915. Source: Imperial War Museum, Q 60499. Brought in as reinforcements to the torn up and shaken Second Division, Arthur’s unit arrived at Observation Ridge and joined an exhausted 25th Battalion, which had undergone a six kilometer overnight march among heavy shelling to begin their work in a supporting operation. They were to provide cover behind the First Division, which was poised to begin the counterattack on the early morning of June 12th. 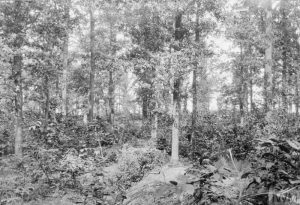 Designated to defend the trenches on the south of Observation Ridge, the 25th was tasked to secure the damaged forest behind them, a jutted and pockmarked area called Square Wood, two kilometers southwest of Sanctuary Wood. With a heavy rain falling, their camp was in terrible shape. No doubt overwhelmed at being thrust into a major military operation Arthur and the new recruits alongside him would have been intimidated at the relentless shelling they underwent in their muddied, rain-soaked trench. Desperate to advance their line, the Germans considered the entire region around Observatory Ridge a desirable goal, anything to further tear up the ground and prevent any possibility of a Canadian counterassault. Even though they were not the target, the 25th Battalion provided cover for the First Division’s impending advance as German shells hailed down upon them, striking at both the First and Second Division’s positions in the front and rear areas they held. As Arthur’s battalion entered the fray in the evening, the First Division’s charge finally commenced at 1:30 AM on June 13th. It would be here that Arthur, along with his fellow recruits called up to reinforce the Second Division, would be catapulted into the horror of one of the more infamous Canadian experiences of World War I, as the fighting at Mount Sorrel and Sanctuary Wood in June 1916 became notorious for its gruesomeness and barbarity. To make matters worse, the 25th Battalion was ordered to be essentially sitting ducks for the charge[i]. They allowed the attacking First Division to charge past their position, while they themselves were to be utilized as reinforcements, if needed they were to go as far as Hill 60, then provide back-up in whatever position they could garner. Not the intended targets of the Germans, they were nevertheless shelled heavily, and received a frightening and treacherous barrage of ceaseless bullets, mortars, and whiz-bangs. [ii] According to Captain Robert M. Clements “the 25th part of the fight lacked any element of glamor or particular glory” but “its men had the very dirty job of holding on grimly for several days and nights, with slender protection against intense shelling and machine gun fire[iii].” The air in and around the front was laden with gas[iv], as several German ‘pip-squeak’ shells were also thrown, a claim attested to by Arthur and the breathing problems that would plague him later in life. It was during this crossfire that Arthur was wounded, only four days into active service. Having run through the trench where he was stationed at to assist an injured comrade, Arthur was struck by mortar fire along the left side of his face, hip and ribcage. He was one of the battalion’s 47 wounded that day, and had to be evacuated by stretcher from the Front. Immediately sent to the No. 2 Canadian Stationary Hospital, Arthur’s injuries were severe enough for him to be sent back across the English Channel to St. John of Jerusalem Hospital in Kent, where he was assessed. Removed from combat, he spent the next four months recovering at the Canadian Convalescent Hospital at Woodcote Park, Epsom. It was here that Arthur developed a breathing irritation from the tear gas that was used in the German bombardment. Though no mention of breathing difficulty or gas is listed in his medical file, there is much documented evidence that poison and tear gas were used by the Germans to defend their position in this battle[v]. As a result of his injuries, for the next four months Arthur was assigned to the Canadian Command Depot at Shorenam and Hastings on the English coast. There, he carried out field duties and partook in intensive physical training for what would ultimately become the harrowing mission to capture the infamous German held ridge that had beguiled French and British forces for two years, and would sweep Arthur into a battle destined to become the defining moment of Canadian military history. 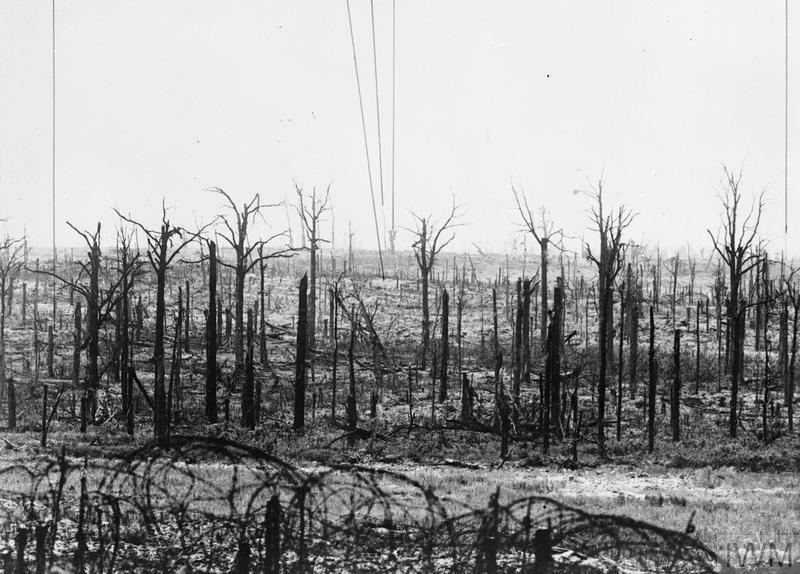 Photo taken in June 1916 includes parts of Sanctuary Wood. Source: Imperial War Museum, Q 47740. The battle of Vimy Ridge was the first and only time all four major military divisions of the Corps fought as a single unit in the Great War[vi]. The task had been assigned to the Canadians after several failed attempts by the British and French forces to recapture the vantage point that was known as the ‘Shield of Arras.’ Preparations for the battle had been extensive and had been going on for months. The effort marked a notable shift in Canadian and Entente strategy after the disastrous campaigns in the Battle of the Somme in late 1916, as an effort to more actively train troops to make their own decisions in battle was considered essential in mitigating Canadian casualties. To successfully take Vimy, the Canadian Command acknowledged that a mass, coordinated effort involving the entire Canadian contingent, backed by active British munitions support, would be the only way to do what their English and French counterparts failed to achieve. They key to overtaking Vimy was not just battle training, but also laying out the logistics and infrastructure needed to successfully engage the enemy, while supplying the front lines with the military support and physical needs in what was shaping up to be a massive, daunting operation. The Battalion spent the first two months of 1917 at Bruay-la-Bussiére, approximately 35 kilometers from Vimy, where by late February of that year they had replenished their numbers and were ready for active duty. 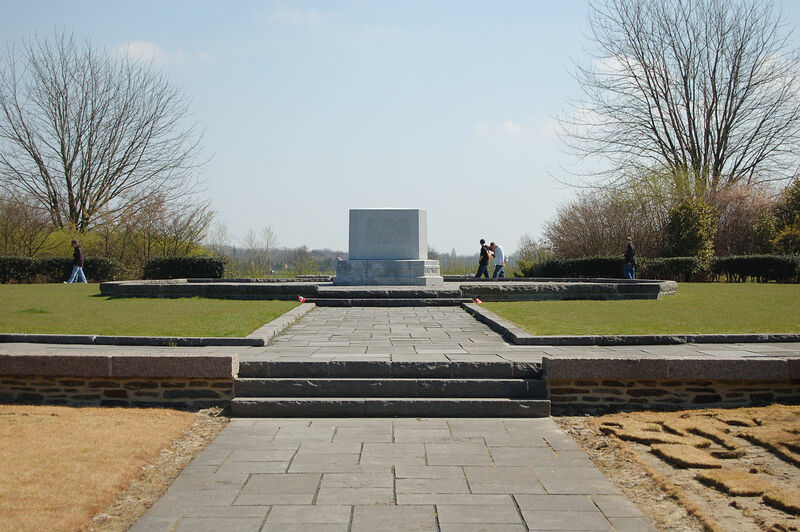 By March, the men were stationed in reserve camps just outside of the devastated village of Neuville-Saint-Vaast, a site known today for its German and Commonwealth cemeteries from the Battle of Vimy Ridge. In 1917, almost all existing infrastructure on the village site had been destroyed, leaving only hollowed basement cellars, which were used for shelter and storage by the Corps. The month of March 1917 involved extensive work for the 25th Battalion, as well as the entire Corps, to prepare for the Vimy Battle. They had no knowledge of the time or date of the attack, as much of the tactical decision making depended on factors outside of Command’s control, such as weather and German activity. Nevertheless, for the remainder of that month, the objectives and strategy for the impending battle, developed by British and Canadian commanders over the previous four months, was drilled into each soldier so they could recite it with almost robot-like repetition. Even more intense was the physical training regimen, which involved a rehearsal approach to almost every single contingency that the soldiers could encounter[viii], though for many, including Arthur, nothing could prepare them for the carnage and bedlam of the coming Vimy storm. 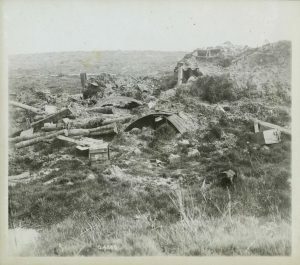 By late March, the Canadians also began shelling the German positions along the ridge, to keep the enemy forces depleted, exhausted, and demoralized for the battle, whenever it would come. As more British and Canadian armaments were moved in to keep the shelling consistent, the Germans responded with return fire. On April 8th, one day before the assault on Vimy was to finally begin, the 25th had moved into Paynessley Trench, in the 2nd Division’s sector, just in front of Neuville-Saint-Vaast. It was there that they fell victim to German counter-fire, which killed four officers and wounded 15. For the remainder of that day, and what would have been a sleepless night, Arthur, like so many others whose fate would be impacted by the battle scheduled for the early morning, would have thought intently about what was to come. Having been wounded by mortar and gas in his first major engagement at Sanctuary Wood, his second shot at combat was to be this colossal, synchronized offensive on which the credibility of his entire country’s reputation rode upon. Thoughts would have been made of his father and siblings back home, and sentiments would have been expressed to his mother Sarah, now 11 years gone and just a scant but fond memory for him. The advance on the ridge began on schedule, with the 25th lined up in front of the German trench, known as Zwischen Stellung. Their mission was to follow their counterparts in the 5th Brigade – the 24th and 26th Battalions, and secure a German reserve trench called the Turko Graben. With zero-hour set for 5:30 AM, Arthur and the men of the 25th had several disadvantages. First, they had to deal with the massive Canadian barrage looming over their heads. Despite the entire Canadian Corps’ experience in carrying out barrages in previous battles, the creeping barrage employed at Vimy was carried out on a mass scale, far greater than attempted in the Somme or at Arras. The strategy was simple in its premise, and required massive amount of armaments, which soldiers like Arthur spent the previous two months hauling to the front. 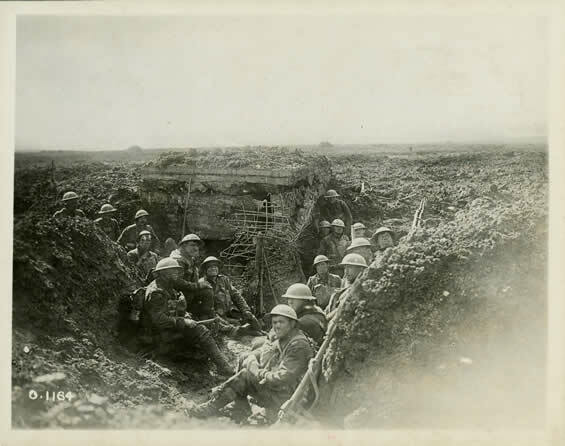 The purpose of the creeping barrage was to provide enough suppressing fire to keep the German soldiers in their trenches, while the men of the Canadian Corps could move forward 100 yards and secure temporary cover. Known amongst the troops as the ‘Vimy Glide,’ the men were given three minutes to move forward, protected by a cascade of Canadian and British artillery. [ix] Between the intervals, the Germans would respond with their own counter fire, a far less intense barrage in scale, but a deadly one for the Canadian foot soldiers nonetheless. Loud and unpredictable, with catastrophic consequences, the back-and-forth barrages were a dreadful but necessary risk for Arthur and the entire Corps of Canadian infantry storming Vimy. The second disadvantage was the weather. Initially calm and cold in the preparations before zero hour, the weather took a boisterous turn once the early morning daylight arrived. A northern wind brought in sleet and a heavy, wet snow that itself became a barrage for the troops waiting for the green light to advance. The third and final disadvantage for Arthur and the men of the 25th was their placement in the front line. Being expected to allow the 24th and 26th Battalions to pass through their position, the 25th then had the unenviable task of following up behind them. That very position made them more susceptible to the German counter-fire[x], and indeed sealed Arthur’s fate in the battle itself. Having reached their position on the ‘Black Line’ at Zwischen Stellung within the hour, the men of the 25th had to encounter the counter-barrage head on, as well as sniper fire from enemy positions not wiped out in the Canadian barrage. It was on one of these advances that Arthur tossed his first aid kit into a crater to a wounded soldier who had been shot by enemy fire. [xi] The advance, however, needed to be maintained and with time for the next counter-barrage ticking away, Arthur kept pressing forward, not giving the medical supplies a second thought. Within the next two minutes, however, Arthur was struck by shrapnel from an exploding shell a few meters away from him. Shielding his face, Arthur avoided life-threatening damage to his head, neck, and chest, which would have compromised his breathing. The heavier shrapnel struck the inside of his left leg, penetrating directly into the knee, shattering the kneecap, and leaving a massive exit wound on the outer side. As the 25th Battalion and 5th Brigade made its way to its second objective—the ‘Red Line’ that was Turko-Graben—Arthur lay in a mud-puddle as troops and bullets surged over his head, with the wound that would ultimately end his participation in the war and, for the moment, endangered his very life. Fortunately, a medic got to him and dressed his wounds in the field as the shellfire detonated above them. The 5th Brigade’s capture of Turko-Graben, along with its eight heavy German machine guns, provided the crucial cover for Arthur to be stretchered off the Ridge, where he was immediately earmarked for ambulance transport to the No. 13 Canadian General Hospital, in Boulogne, France. Of course, the success of the 2nd Division’s mission at Vimy was reflective of the overall success of the entire Canadian operation, a task commemorated by historians today, honoring the 11,000 Canadian casualties injured or killed in the battle. Hill 62 (Sanctuary Wood) Canadian War Memorial. Source: Wikimedia Commons. The author wishes to thank Gordon & Marilyn Brown, Roger Mullen, and Bruce MacDonald for their invaluable help & assistance in writing this article. [i] Captain Robert N. Clements, Merry Hell: The Story of the 25th Battalion (Nova Scotia Regiment), edited by Brain Douglas Tennyson (University of Toronto Press, 2013), pg. 121. [v] Tim Cook, No Place to Run: The Canadian Corps and Gas Warfare in the First World War (UBC Press, 1999), pgs. 74-76. [vi] Pierre Berton, Vimy (Anchor Canada, 1986), pg. 178. [ix] Geoffrey Hayes, Andrew Iarocci, & Mike Bechihold, eds. Vimy Ridge, A Canadian Assessment (Wilfred Laurier University Press, 2009), pgs. 176-178.